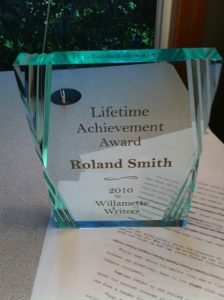 Last night I had the great pleasure of receiving the 2010 Willamette Writers Lifetime Achievement Award… I don’t think my lifetime is nearly over yet, but it was wonderful to get the award. It was presented at the Willamette Writers banquet during their annual conference. If you live in the Pacific Northwest, and you’re interested in writing, you might want to join them. They put on an amazing conference every year with editors, agents, and writers from all over the U.S. Just click the link above to go to their site. Thanks Willamette Writers! The award is up on the shelf and will give me encouragement every time I gaze upon it. Oh… And don’t forget. I have an I,Q book contest running. If you don’t enter you can’t win. Congratulations! An honor well deserved! Congratulations!! WOW! What an great organization,they chose the best! You should be very proud. ← 2nd Contest!!! Prize: Another signed copy of I,Q Book Two: The White House.